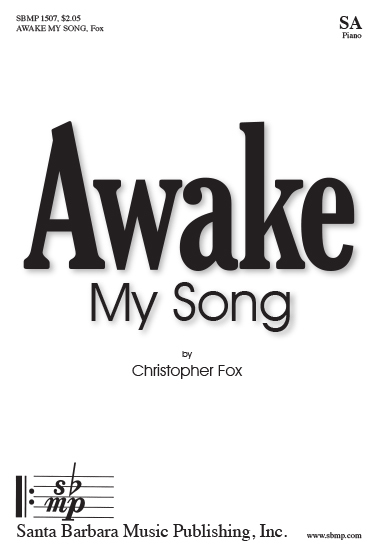 Awake My Song, Christopher Fox | Santa Barbara Music Publishing, Inc.
Once a dream, now a reality. My heart sings an everlasting melody! My thoughts now turn to the next time that I feel this way. "Awake My Song is choral writing at its finest! My students loved this piece! They were able to immediately connect with the text and the musical composition itself, composed by Mr. Fox, inspired to them to find their best voices! It is easily accessible for Middle School voices but would still work well with High School groups. Highly Recommended! " "Christopher Fox is a new bright star in the sky of choral arranging for children! His awareness of the child voice, teacher practices, and immense talent for writing beautiful accompaniments and melody is refreshing and inspiring. My students connected with and thoroughly enjoyed singing this piece. We paired it with Dilworth's "Everlasting Melody" (inspiration for the text) and it was an amazing success!" "My kids loved learning and performing this song! From a teaching perspective, this song is gold. It easily lends itself to independent reading and Mr. Fox's smart use of text allows for quick attention to vowel unification. The accompaniment is beautiful and supportive. This is definitely one to add to your library!" "Our district was fortunate to have the treble portion of our District XI Middle School Honors Choir perform this song under Christopher Fox's direction. The song is perfect for treble choir voices of all ages, accessible for middle school or elementary but still challenging and interesting enough for high school voices. The students loved the piece and really related to the text. "